Hot as a .44, and twice as fast! 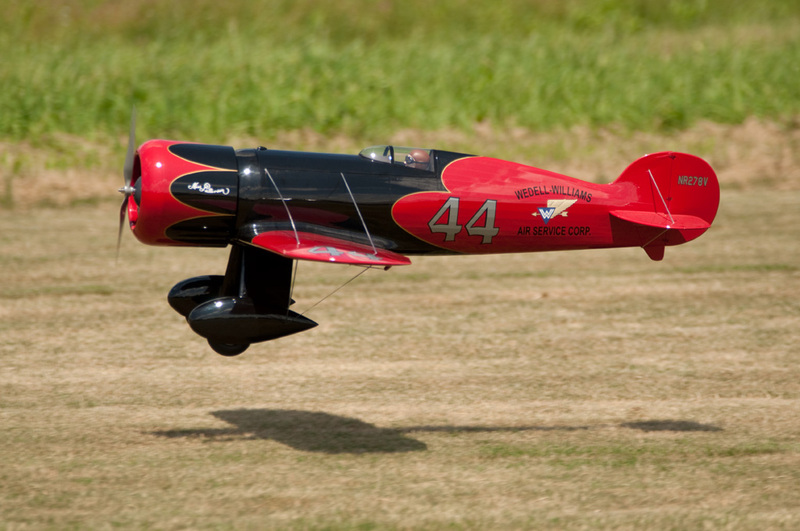 Jimmy Wedell was one of the most successful racing aircraft designers of his era. With only a 9th grade education, he had a real ìseat of the pantsî approach to designing. The Model 44 was literally built from chalk marks on the hangar floor. The Model 44 was the first land-plane to break 300 mph, and Roscoe Turner set a transcontinental speed record in his Model 44. Our model 44 is 1/6 scale and is designed for electric power. It features a unique wing latch mechanism and flying wire attachment scheme which does not require any tools for field assembly. The size is small enough to be affordable, yet large enough to fly in most conditions. This short kit includes laser-cut balsa and plywood, two E-size sheets of printed plans, and a vacuum-formed plastic canopy. You can download the instruction manual here or from the Instructions tab.